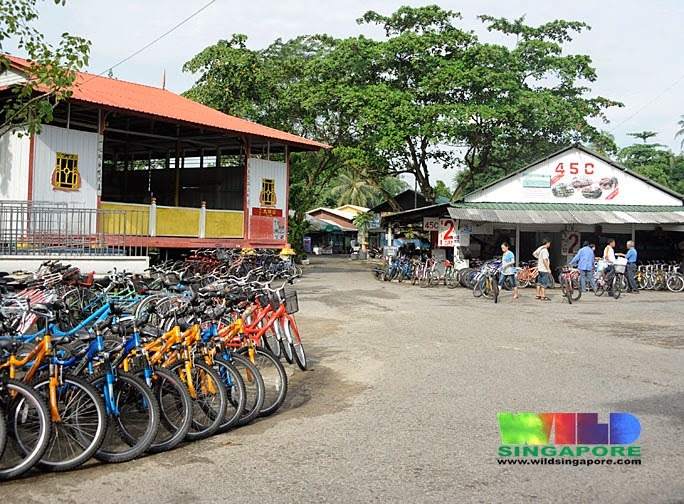 Have you ever wondered what this interesting structure (left, photo below) at Ubin town is used for? A stage seen at Ubin town. From 12 May to 17 May 2014, this stage will be transformed into a wayang (chinese opera) performance stage, showing Teochew opera. It is the birthday celebration of the Tua Pek Kong (or Tu Di Gong/ Da Bo Gong). The Pulau Ubin Fo Shan Ting Da Bo Gong Temple has made arrangement for a grand celebrations of the deity's birthday with rituals, performances and even Getai (live stage) performance on the last night. *Note* Another Taoist deity is too named Tu Di Gong, but they are different persons. Celebration posters seen everywhere on Ubin and even on bumboats. The better news is that bumboat services to and from Pulau Ubin will be FREE in the evening till night during this festive period. Look out for the nicely decorated Ubin jetty that welcomes all visitors and worshipper to this joyous occasion on Pulau Ubin. Ubin jetty decoration, May 2010. Did I mention that fortune ang bao (red packets) will be given away to? It is while stock last! Celebration rituals will begin in the mornings of 12 May and 13 May with Teochew opera performances every evening. This is one of the very few occasions where the probably-the-last wayang stage is transformed into a beautiful opera stage, mainly to entertain the gods and deities. 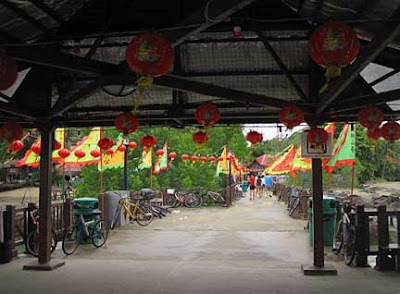 However many people and tourists have been attracted to Pulau Ubin during these festivals to witness the dying Chinese opera culture. On 17 May, the last night, the Teochew opera will perform in the morning at 10.00 am while the evening performance will be replaced with exciting live stage song singing show known as Getai. I am sure this climate performance in celebration of the Chinese earth god's birthday will be a great hit. So be sure to make a trip down to experience it. 2.30pm - Giving away of Altar blessed charms, while stock last.